If you're fed up with life, questioning whether you should stay married or thinking you might be better of with someone else, marital therapist Andrew G. Marshall has a radical idea to help you move from the first half to the second of your life without messing everything up. In part one of this essential new book he explains:*	The three central questions you need to answer (and why everybody else is distracting themselves and avoiding facing them). *	How to put what's happening now into the context of your whole life journey. *	How to avoid the tempting short-cuts that cause more heartache in the long term. *	Why if you pass this mid-life test everything is up from here.If it's your partner who has turned grumpy, critical and blames you for everything, you will be feeling alone and full of despair. 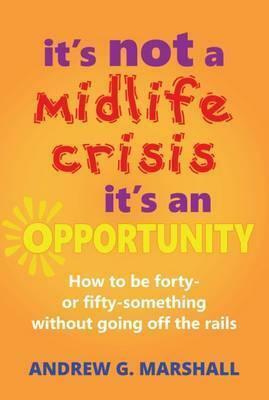 Don't worry, in part two of this compassionate book, he explains:*	A whole new vocabulary for discussing the mid-life crisis without putting your partner's back up. *	What's really going on in your partner's head. *	What causes depression and how to help. *	Five killer replies to the blocks that stops you talking properly about your marriage.Together you will learn three new skills that will either change your marriage into the connected, fulfilling and loving relationship of which you've always dreamed or help you separate amicably and be great co-parents together. Andrew G. Marshall is the UK's best know marital therapist and has thirty years' experience helping couples make better relationships. He is the author of eighteen books - including the international best seller 'I Love You But I'm Not In Love With You'. He trained with RELATE but now leads a team of therapists in London and Sussex offering the Marshall Method.